Beautiful, sunshiny day in the Bay Areas as the Stanford Women’s Basketball played their Breast Cancer Awareness game vs. Arizona State. Stanford looked all-cool in their pink, pink shoes with neon pink laces and pink piping on their shorts. Arizona State was all in pink, pink everything. Shorts, shirts, numbers. I guess since they were the away team they got to be “dark” so could pinkify their uniforms to the max. It didn’t help them score, though. Stanford beat them 69-45. All season long Stanford Coach Tara VanDerveer has been imploring other team members not-named-Chiney-Ogwumike to step up and score. Last game it was Mikaela Ruef with a career high 11 points and her first career double-double. Ruef even said in the post-game interview that the coaches were asking her to shoot instead of looking to pass. Bonnie Samuelson goes in for a layup and hit five 3-pointers for a career high 19 points. Photo by Bob Drebin.This game it was Bonnie Saumelson’s turn to step up. She scored a career high 19 points and made a career high five 3-point shots. She is not nicked named Bonnie the bomber for nothin’. Joslyn Tinkle also got in on the “First” act, by getting her first double-double of the year (11 points and 13 rebounds). Bonnie said Tara pulled her aside and said, “I have confidence in you.” Bonnie would have scored more in this game, but she picked up her fourth foul at the 8th minute mark and Tara did not have confidence in her not fouling out. Chiney Ogwumike, on the other hand, scored 26 points and grabbed 14 rebounds for her 19th double-double of the season, and her 8th in a row. You can see why Tara has been begging other players to match her or at least score in double digits. On the other hand, after the trio of double-digit scorers, starters Ruefie scored five and Amber Orrrrange four. The only bench player to score was Jasmine Camp with two points. 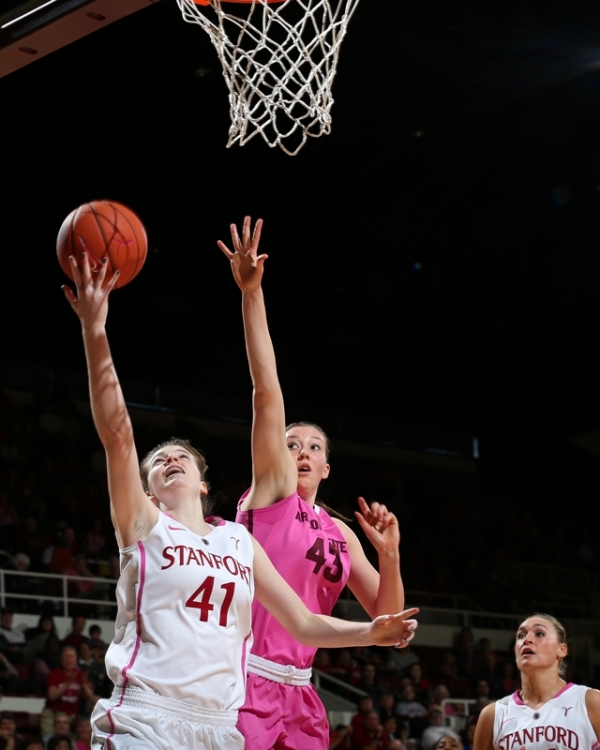 Bonnie scored five 3-pointers, but Stanford was 5-20 from behind the arc. Really? No one else could make a three? Stanford needs scoring consistency at every position, not just one or two, possible three players. Speaking of starters, Toni Kokenis was in the sweat-suit-of-injury for the second game in a row. Fans who sit next to the bench got the word that it was for “an upper body injury.” That’s more then we got from the staff at last game’s press conference of “undisclosed medical condition.” Toni has missed games before with the same “undisclosed medical condition” and “upper body injury.” What’s weird is how evasive the staff is being about her condition. Anyway, we wish her a speedy recovery from whatever it is that ails her. Stanford definitely missed the experienced guard play of Toni, sometimes having only one guard in at a time. When Arizona State went into their half-hearted press, Chiney Ogwumike brought the ball up. Why is our post player the only one capable of dribbling the ball out of a press? Hard-pressing teams will eat us up comie NCAA tournament time. Speaking of guards, Stanford’s Alex Green made her first appearance in 15 months. She played the last few minutes of this game and scored no points. She ruptured her Achilles tendon in Nov of 2011. Ask Candice Wiggins how difficult it is to come back from that when she missed a whole year of the WNBA for the same injury. We wish Alex continued success at recovery. Stanford’s win keeps them tied with Cal for first place in the Pac-12. Next up is a trip down south to see USC and UCLA. Follow all the double -doubles with C and R on Facebook and Twitter, too!